The room was abuzz with appreciations as a panel of Mills Teacher Scholars concluded their 90-minute workshop on “Inquiry as an Equity Strategy” at this year’s Teachers for Social Justice Conference in San Francisco. 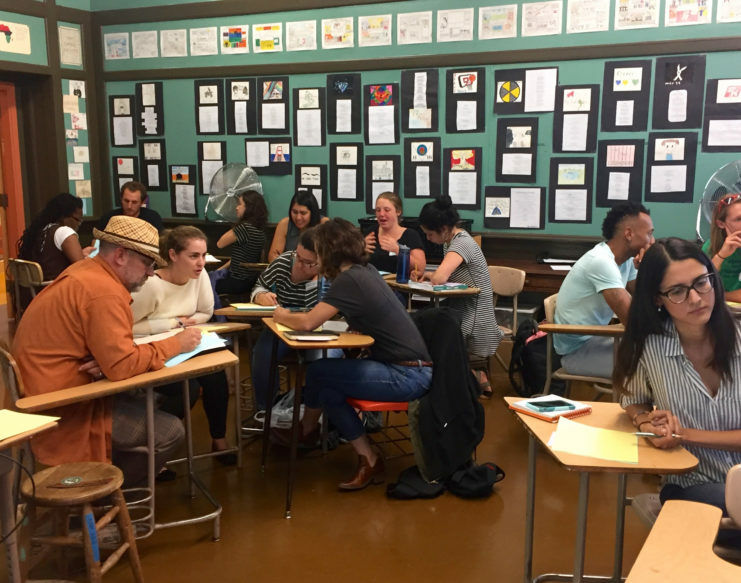 Dedicated teachers from across the Bay Area packed into a Mission High School classroom, eager to learn more about how they could place social justice at the forefront of their practice. Each teacher scholar on the panel recounted highlights from their inquiry journey and surfaced one key way in which inquiry is connected to equity. Roosevelt Middle School teacher, Nick Easter discussed how engaging in inquiry helps teachers build relationships with students and discover what they need in order to thrive. His story centered on helping African American boys develop social-emotional skills through community-building classroom routines. He shared a powerful audio clip of an interview he conducted with his student, asking questions to better understand what helps him feel seen, loved, and welcome at school. Oakland Tech High School teacher, Steve Wright shared his experience of studying school-wide grades by demographic and feeling deeply concerned about the achievement gaps between white, African American, and Latino students at his school. He explained that through taking a hard look at data, inquiry helps us get honest about what is really happening in our classrooms and schools and take deliberate action steps toward positive change. 4th-grade Melrose Leadership Academy teacher Luz Salazar-Jed walked the audience through her experience of collaborating with colleagues to better understand and teach students who are newcomers to the U.S.
She illustrated the ways in which collaborative inquiry encourages us to have honest, critical conversations with colleagues and begin to unpack implicit biases. After listening to these examples of inquiry in action, participants were guided by Mills facilitator Julia Beers Moss to surface their own “teaching puzzle” – a question or concern that they go home thinking about – and then begin to consider why it could be happening and what action steps they could imagine taking to address it. They then engaged in collaborative conversations with colleagues to unpack their puzzle and try to see it with a new lens. I loved the opportunity to sit back and listen. My colleagues echoed my thoughts in ways that helped me see own teaching puzzle from a new angle. We went so deep in such a short amount of time! I appreciate my thinking partners for being willing to be vulnerable and share their uncertainties. I learned so much from the inquiry stories shared by these masterful teachers. Mills Teacher Scholars is helping us invest in and respect the experience, expertise, and value of teachers’ work as a method of change, affirming the belief that school improvement can be accomplished by teachers.